Yes, dear readers, we are super close to 500 followers on Pretty.Random.Things. 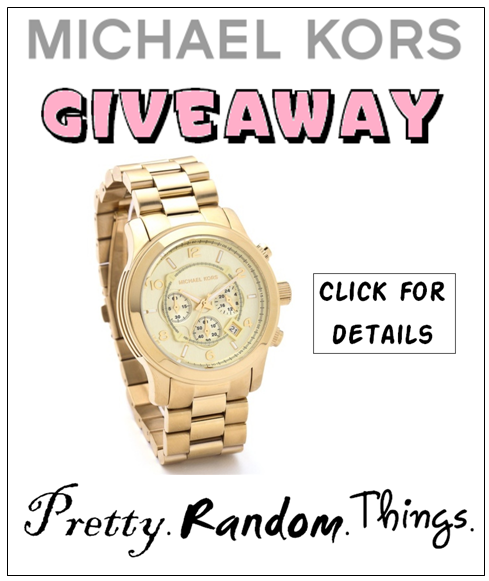 now, and that means that I will be able to draw the winner of the Michael Kors watch very soon. My level of excitement is through the roof, I don't know about you? Thanks to everyone that's entered so far, and has shared the giveaway on Twitter, Pinterest, Facebook and your personal blogs. And for those of you that haven't entered yet, you can check out how to be entered into the giveaway over HERE. On the day that I hit 500 followers, I will close the giveaway and announce the winner as soon as possible here on Pretty.Random.Things. and also on Facebook. The winner will also receive a personal message from me on Facebook. Please keep sharing the giveaway so that we can get to 500 followers in the next few weeks, because wouldn't a beautiful gold watch just be the perfect accessory for your Christmas party? Great Job and Congrats on your blog!